Last year, it was reported that supercomputer IBM Watson diagnosed a rare form of leukaemia in a patient at a University of Tokyo-affiliated hospital whose case had baffled her medical team. The cloud-based, artificial intelligence-powered supercomputer is capable of cross-referencing and analysing data from tens of millions of oncology papers from research institutes all over the world. From vast volumes of data, it can instantly pull out the information it needs, much faster than humans can. The University of Tokyo reported that the 60-year-old Japanese woman was correctly diagnosed in just 10 minutes by Watson, after her genetic data was cross-referenced with the computer’s own database. More and more, health technologies originally viewed as futuristic – like virtual avatars and chatbots – have become reality. These technologies use artificial intelligence (AI) to mimic conversation with people, interact on the internet and perform other tasks that would normally require human intelligence. One example of this is Sensely, a mobile triage smartphone app currently being trialled by the National Health Service (NHS) in the United Kingdom. Olivia, Sensely’s artificially intelligent virtual nurse, guides patients naturally through their personal healthcare needs on demand 24/7, 365 days a year. The blue-eyed, dewy skinned young woman in blue NHS scrubs, gathers information by listening to the patient and asking questions, similar to a person-to-person interaction with a clinician. Sensely was developed by a Californian start-up, but as Richard Corbridge, chief executive of eHealth Ireland points out, there’s no need to go to California to see examples of how AI is revolutionising healthcare. 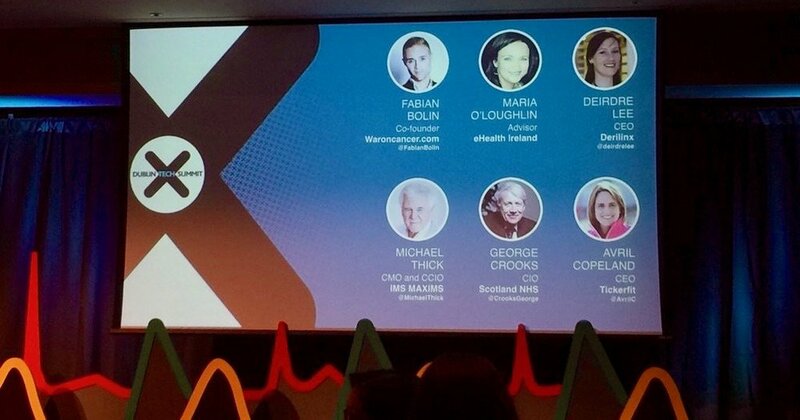 Five out of the top 10 start-ups in Dublin last year were in the digital health arena, he says. Corbridge will be speaking at this week’s Dublin Technology Summit 2017 (February 15th to 16th) on the topic of “Health Reality, Not Science Fi”. The eHealth Epilepsy Lighthouse Project has developed the infrastructure to sequence the genome (figure out the order of DNA nucleotides in a complete set of genes) in patients and to record this information for clinicians to use in the delivery of care. The significance of sequencing the genome is that it can be used by healthcare systems across the world to predict what will happen to an individual patient’s health. Corbridge remarks: “Take a patient with epilepsy who has had an epileptic seizure every day for 20 years at least. By taking a sample of that patient’s DNA, we can sequence the genome and enter the information into his/her EHR. Over the past few weeks, every maternity hospital in Ireland has been visited by teams from eHealth Ireland to identify where the gaps are in their digital health capabilities and to close them. “Going forward, every newborn baby in hospital will have three devices in their cot, monitoring respiration, temperature and heart rate. All of this information is automatically transferred to the baby’s EHR. “Instead of constantly checking these levels in individual patients, each nurse has a tablet PC where they can see the vital information on all the babies in their care at their fingertips, including requests for tests and scans and results. Within the next two years, every hospital in Ireland will have this technology. It’s an amazing leap for Ireland in a short space of time,” says Corbridge. With an increased emphasis on getting patients to self-manage their health where possible, rapid advances are being made in smartphone and wearable devices. Another eHealth project is an app for patients with bipolar disorder which uses a chatbot to engage with the user, monitor their mood and try to keep them on the right track. With the patient’s consent, the app can contact their carer or GP if it feels they need support. Dublin-based start-up TickerFit enables health professionals to prescribe, educate and monitor a heart patient’s recovery from a distance through a wearable device. Founder Avril Coleman is another of the speakers at this week’s summit which brings global leaders in innovation, technology and business together to shape the future of global trends and technologies. The two-day summit will host 10,000 members of the tech community at the Convention Centre Dublin this Thursday and Friday. Fabian Bolin, cofounder of War on Cancer, will be talking about waroncancer.com, an online storytelling community to help people deal with the mental challenges that come with a cancer diagnosis. Music’s new role in healthcare and the evolving world of HealthTunes will be explored in a session entitled “When Medicine Rocks”, with the panel discussing the possibility of a time when music, given its undeniable influence on our emotions, could be prescribed along with conventional medicines. To learn more visit dublintechsummit.com. On September 26th, we had the great opportunity to be part of the official launch of Ireland's National Health Innovation Hub. As part of the launch, we got to showcase TickerFit to the many notable attendees including, Minister for Health, Simon Harris and Minister for Housing, Planning and Local Government, Simon Coveney. A wonderful morning of excitement and innovation.